The hundreds of the best! “From high quality products to high quality of life” – with such a motto, was awarding of the best goods, works and services of Ukraine , including the products of AGATASTAL.Already once again our company becomes better, obtains prestigious awards and is a worthy manufacturer of entrance metal doors not only in the region. 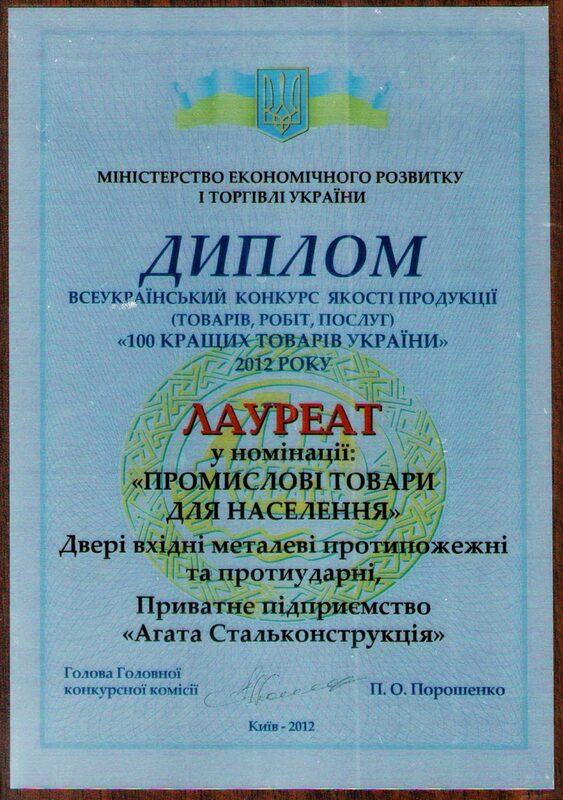 So, recently we became the laureates of the All-Ukrainian competition of quality of products (goods, works, services) “100 best goods of Ukraine”. This competition was conducted in accordance with the Decree of the President of Ukraine of 23.02.2001 №113 “On Measures to Improve the Quality of Domestic Products”, the Resolution of the Cabinet of Ministers of Ukraine dated November 16, 2001 No. 1502 “On the Annual All-Ukrainian Quality Contest”, the Concept of State Policy in the Field of Product Quality Management (goods, works, services), which is approved by the order of the Cabinet of Ministers of Ukraine dated August 17, 2002 No. 447-p, the order of the Cabinet of Ministers of Ukraine of 31.03.2004. № 200-р “On approval of the plan of measures for the implementation of the Concept of state policy in the field of quality management of products (goods, works, services)”. In the nomination “Industrial goods for the population” AGATASTAL presented “Doors of incoming metal fire and shock-proof”. – We are extremely pleased that the independent expert council of the State Enterprise “Ukrainian Research and Training Center for Standardization, Certification and Quality” has noted our company as one of the best in Ukraine. Being in hundreds of product leaders is a great honor and we will do our utmost to ensure that we do not lose the trust our customers place on us, “said Vladimir Galanets, director of AGATASTAL. More than 250 enterprises were invited to participate in the national stage of the competition – the winners of the regional stages. 226 enterprises of various branches of economy with 237 kinds of products confirmed their participation .